Yes, my wife and I are interested in any crew opportunities in the month of January 2018. If there are any available berths, please keep us in mind. Hi Tim, sorry about the delayed reply, sorry we missed your January 2018 window. We hope you will have the opportunity to join us at some point in the future. Please email us at schoonerruth@gmail.com and we can try to arrange. Looking for position onboard a boat during this time. I am a professional mariner captain of a fire boat for the city of Toronto. I have some maritime credentials. I would look forward to an opportunity, thank you. Hi Stuart, We have a few spots remaining in our guest crew programme. 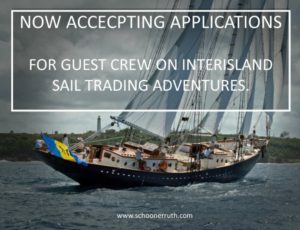 Please email us at schoonerruth@gmail.com and we can provide you with all of the details. Hi Steve, sorry about the delayed reply. We do have a few spots remaining in our guest crew programme. 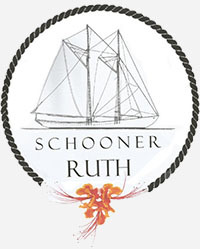 Please email us at schoonerruth@gmail.com and we can provide you with all of the details.